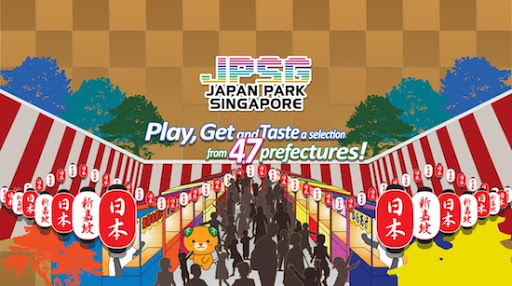 Japan Park Singapore, 4 & 5 August 2018 - Experience the Delights of 47 Prefectures of Japan! Just for this weekend, you do not need to fly to Japan in order to experience the traditions, and gather insights on the lifestyle and culture of the country. You just need to head to Japan Park Singapore exhibition at Suntec Convention Centre! The show is a one-stop destination for a taste of all 47 prefectures in Japan. 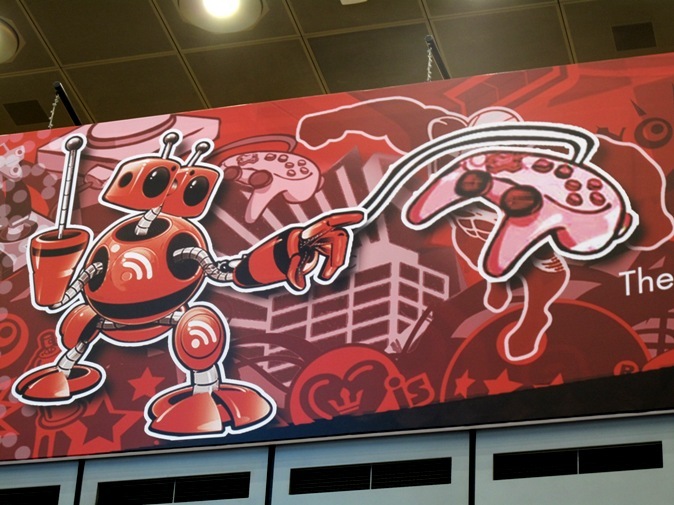 It is an ambitious feat that was pulled off by the show organizer Amuse Entertainment Singapore, together with partners Bushiroad, OJ Partners and WAttention, and support from SOZO (the creators of Anime Festival Asia), Japan Creative Centre (JCC), JNTO Singapore Office and JETRO Singapore. When it comes to priorities, good food is pretty much at the top of the list for most locals. In the WA-SHIOK Gourmet Festa area, one will find much delectable yum yums to choose from! During the media preview, Red Dot Diva had a taste of the sausage from Teppei Syokudo booth. The juicy meat had a flavourful crunch to it. Don't miss getting one of these! When Red Dot Diva thinks of food *and* comics, the first name that comes up in her mind is Marvel's VP and talent scout C.B. Cebulski, who is also a foodie and has his own blog called Eataku. 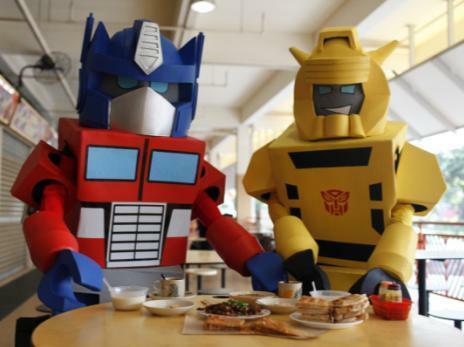 Locally, a well-known food related comic called Dim Sum Warriors by couple Colin Goh and Woo Yen Yen, comes to mind. Dim Sum Warriors was were recently adapted into a musical production staged in China. Others include Red Dot Diva's friend Benjamin Chee of "Charsiew Space", who relished in depicting charming stories surrounding food (yum yum! ), as well as Max Loh, who has a self-published book called "About Food". Max recently collaborated with C.B. Cebulski to produce a limited edition superhero food-related postcard entitled "Defend Local Flavour" at this year's STGCC. And if you gave fan love to C.B. 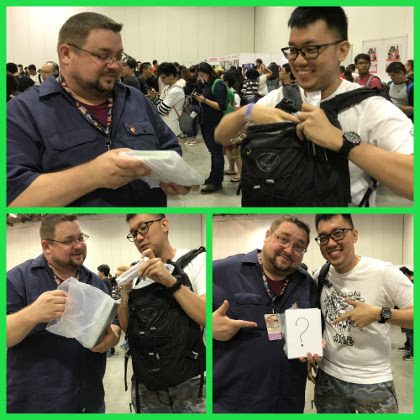 Cebulski at his STGCC Walk of Fame sessions, you should already have received the "Defend Local Flavour" postcard specially signed by him! The postcards were available *only* during STGCC 2017. Max Loh, the illustrator of the special postcard, is a self-taught artist with a very science-y background. He graduated in Biomedical Science, and has worked as a Research Officer for the past 7 years. You can find his works published in anthology books, "Liquid City Vol 3" (Image) and "Driving Malaysia" (Maple Comics). The later was commissioned by the tech company which owns the popular ride-hailing app. Max also has a few self-published books like "The Road Not Taken" and "Pointes de Contrôle". Red Dot Diva finds his writing and drawings deeply personal and contemplative, which may help put things into perspective for those who have musings in similar subjects. Here's a nosy interview with Max regarding his experiences in his journey of being a mostly indie comic book writer/ artist. Red Dot Diva: You mentioned that you are a self-taught artist. How did you improve on your craft since you started drawing comics? Max: Well, I've been to art classes as a kid, so that might not be considered as strictly 'self taught'. However, those were mostly landscapes and posters for school work. I've learnt the visual language of comics through guidebooks (does anyone still remember the "How To Draw Manga" series of books from the early 2000s?) and emulating things I like from comics I've read. I put out my first self-published comic with friends in 2003, and I think it was only back in 2012 that I started finding my footing in terms of style and the kinds of stories I want to tell. Diva Checked Out The Official F.R.I.E.N.D.S. Central Perk Cafe in Singapore! The Official F.R.I.E.N.D.S. Central Perk Cafe finally opens to the public today, 26 November 2016, from 6 PM to 10 PM. If you can't make it on its first day, the cafe (aptly located at the ground floor of Central Mall; the shop front faces Magazine Road) operates from Tuesdays to Sunday, from 10 AM to 10 PM. After a rousing and successful crowdfunding project, the journey of bringing the fictional Central Perk Cafe to existence has its share of ups and downs. Generally, Red Dot Island fans who remember and watch the TV series were joyous when Jit Min, founder of the passion project, shared that he was looking for a suitable space for the cafe. However, a few months later, the brickbats came fast and furious when a very atas-sounding SGD 1,000 membership package was announced. "Is this going to be a scam?" cried many cynical folks. With a couple of notably unfortunate incidences recently (*coughHelloKittycough*), Red Dot Diva is not surprised that some people felt that way. Especially when the owners were tight-lipped about providing more details at that time. Regardless of the naysayers, there were more than enough fans who were eager to see Red Dot Island get their very own Central Perk Cafe. 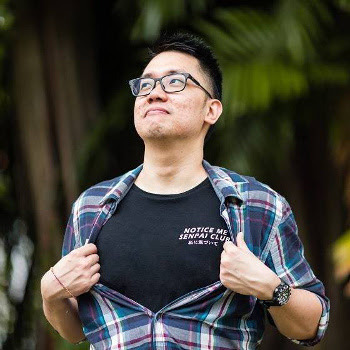 Meet Benjamin Chee, Writer/ Artist of Comic Book Charsiew Space! 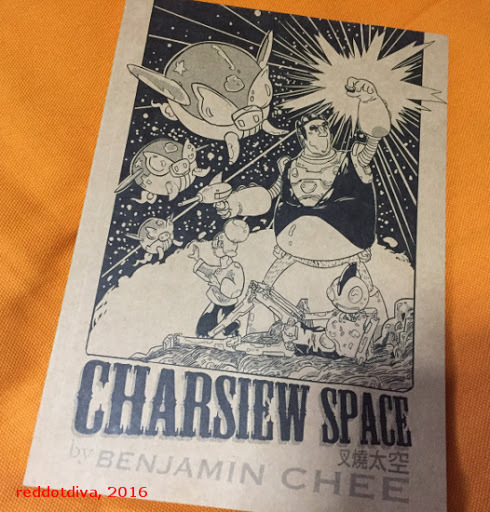 As someone growing up in Red Dot Island, where most people are food-crazy, reading Benjamin Chee's self-published comic book "Charsiew Space" was like nomming on comfort food. To be more exact, it was like savouring yummy local dishes while nonchalantly trotting about on a wild space adventure. In a sector of a certain galaxy, pork including the traditional roasted version called charsiew, has been banned. Sow, a shrewd elderly Ah Mm (i.e. "old lady") teams up with a space smuggler and his robot to bring the delicacy back on the menu, but not without re-pork-ussions from the citizens of Pig Planet. Red Dot Diva thought "Charsiew Space" was such a lively and hilarious comic that she recently sent a copy of it to Paul Levitz (formerly the president and publisher of DC Comics) as a small birthday gift . He thought Benjamin's art was "charming". 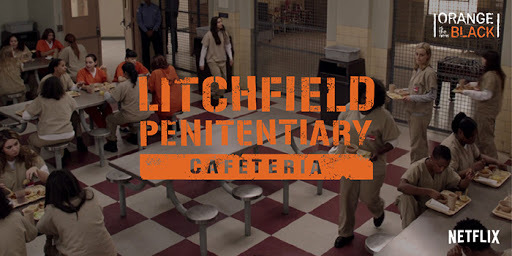 Welcome to "Orange Is The New Black"'s Litchfield Penitentiary Cafetaria: No... No Complaints About The Food! Hailed by Netflix as one of its most bingeworthy and re-watchable original series, "Orange Is The New Black" (OITNB) the female prison comedy-drama show based on memoirist Piper Kerman's book, just premiered its fourth season last week. According to statistics, about 53% of OITNB fans has re-watched at least one full season of the series. To create some hype for the series and its new season, Netflix Asia brought Litchfield Penitentiary's Cafeteria right into the heart of Orchard Road. Fans could cure their addiction for two days on 16 and 17 June 2016 when diner & bar Overeasy transformed their Liat Towers branch to the familiar "Orange Is The New Black" women's prison. If it weren't for Red Dot Diva's geek pal Jas, she would not have known about this interesting promo that was held free of charge, specially for the show's fans. With her fast skillful fingers (*Diva smirkes and wriggles her eyebrows*), she managed to chope their seats for lunchtime on Friday ,17 June. The air(con) gets a few degrees chillier. More commuters attempt to burrow in their hoodies, trying to escape from the wet monsoon season. 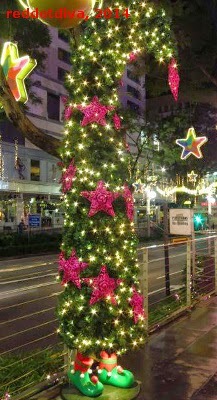 Little human monsters run recklessly afoot at malls as if they were specially bred to trip people up.... And to add insult to injury, the vapid Christmas lighting dangle all around Orchard Road like are cash registers made of gold. There's simply no better time (*snark*) to channel your geekiness in other ways so that the year-end holidays are More Kapow, Less Humbug. Here are Red Dot Diva's Top 5 Weird (Cute) and Offbeat Things she spotted during the Christmas season. 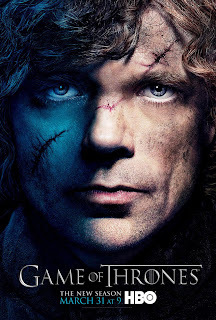 Savour 2014 - HBO Asia Throws A "Game of Thrones"-Styled Purple Wedding! Savour 2014 was back in town recently at the Promontory - a very picturesque sport just a stone's throw away from the old Customs House tower facing Marina Bay Sands. It was unfortunate that on the same week, not only had the event returned to Red Dot Island, so did the horrible haze caused by land clearing fires around Indonesia and Malaysia. But haze or no haze, no respecting geek would turn down an invitation from the brilliant folks at HBO Asia. Especially when it's a "Game of Thrones"-styled *wedding* invitation - the kind that is fit for a king - even if he's a king you'd wish would be attacked by a million zombified scorpions. 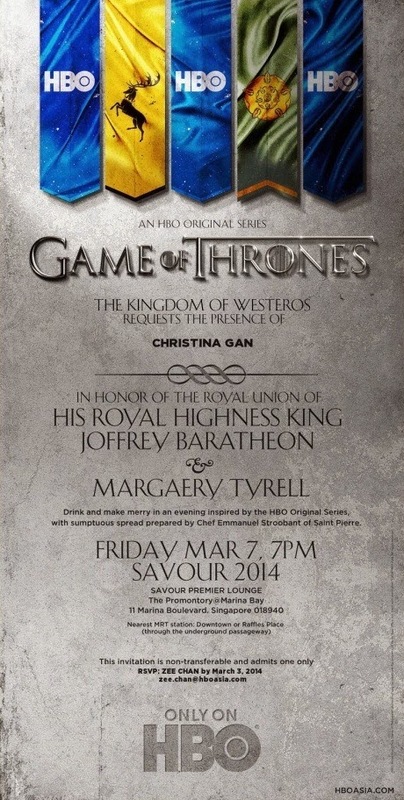 Yep, it's an invitation to celebrate the union of Joffrey Baratheon and Margaery Tyrell. With precious invitation in hand, Red Dot Diva took the opportunity to wear her favourite amethyst pendant to the party held at the Savour 2014's Premiere Lounge. That location turned out to be a secluded spot hidden away at the 2nd level of the makeshift gourmet hall with a gorgeous view of MBS and its surroundings. HBO Asia is definitely swaying towards the side of evil these days. Especially when it comes to the insanely popular TV series "Game of Thrones". Would decent folks marry geekery, gourmet food and yummy eye candy together? No! 'Coz that's a downright evil thing to do! Red Dot Diva could imagine a huddle of HBO Asia executives scheming over how they could make the premiere launch as enticing as possible. Let's screen the opening episode of Season 3 "Game of Thrones" surrounded by lots of good food, they must have determined. And that's how a bunch of hapless invited guests, including Red Dot Diva, ended up at Savour 2013 one fateful evening of March 12th for HBO Asia's "Game of Thrones" Season 3 premiere launch party. Frankly.... Red Dot Diva just couldn't help snickering at the images that steamrolled into her email in-box that day. You see, well-loved Transformers characters Autobots Optimus Prime and Bumblebee decided to drop in to the Red Dot Island last week. And the first thing they did was to have a taste of the iconic Singaporean breakfast consisting of kopi-O, kaya toast and you tiao at the Old Airport Road Food Centre. Can Autobots even digest food? Red Dot Diva is confused. C.B. Cebulski holds the long and fancy title of SVP, Creator and Content Development of Marvel Entertainment but he's actually one of the most down-to-earth person Red Dot Diva has ever met. This is C.B. 's second visit to Red Dot Island as a guest of STGCC. This time, he arrived a few days early so that he could eat his way across the country one more time. 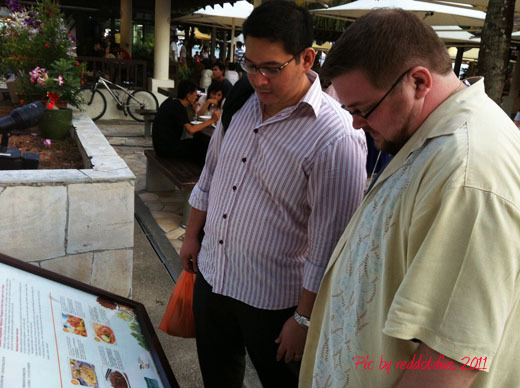 Instead of being brought around various food places by the Singapore Tourism Board, C.B. decided to go local and asked for a small group of island geeks (and geekette) for suggestions. If one is not already aware, C.B. 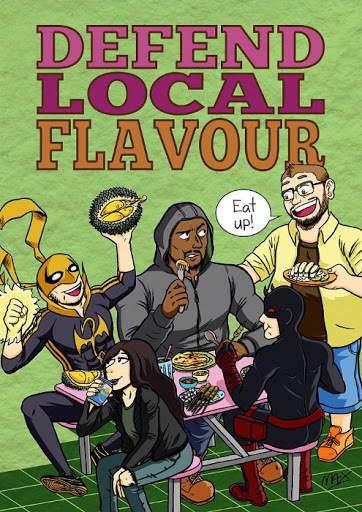 is a big-time foodie and he aimed to top last year's eating record in of 15 meals in 6 hours which he accomplished together with fellow comic creators, Matt Fraction and Gail Simone. With the HereBeGeeks guys, Melvin Yong, Ryan and moi assisting C.B. with the nom-fest, beating the previous year's record was chicken feed. Red Dot Diva chirps (well actually not quite, she has a pretty low voice.. lol): "WELCOME TO OUR STGCC GUESTS!" It's only a few hours more, peeps. 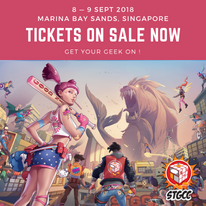 LESS THAN A DAY to STGCC this weekend! W0000t! The anticipated guests arrived on our Red Dot Island in mini groups since yesterday. It was raining cats and dogs earlier that afternoon but it sure didn't mar the general cheerful spirit of things.